As I was collecting my electricity usage data so that solar vendors could make their bids, I came across an unexpected “generation credit” on. PGE LOGO . It provides a credit to customers who primarily use within Tiers 1 and 2 and a charge for those who use energy in Tiers 3 and 4. Customer Generation Charges: The cost of creating electricity to power your home or business. We answer your most common questions about the Net Surplus Compensation ( NSC) program. Not only did it allow CCA's to be formed, but it mandated that all customers served would be automatically enrolled with an option to opt-out. I haven't seen a bill under NEM 2, but I believe there will be a separate calculation area and those charges will be added to your true-up. Just because the Legislature made it a law, does not make it honest and open. Rather, it should be viewed as a simple method for commercial solar customers to preliminarily cross-check their NEM figures to determine whether there are more significant problems to investigate. Mon, Feb 12, , 8: SVCE officials say they have successfully signed up more than , customers throughout Santa Clara County, proving that the new utility is a sustainable business model. SVCE officials announced they would pay back Mountain View and other cities that helped get the utility off the ground. Eight other cities later joined the program and contributed smaller amounts. The terms of the loan specified that this money didn't need to be repaid until ; however SVCE board members say they had no reason to wait to make good on the loan. Unless you opted out by mail from SVCE, you automatically became enrolled. It's pretty easy to "successfully sign up" people when you do it in a sneaky way. I'm proud to be a customer of an ethical and green company, and I'm grateful that MV's leaders created this option for us. I wonder how many trees were trimmed by SCVE? Also, how many SCVE trucks were dispatched to restore service outages? There are two elements to your power service - generation and transmission. I am very happy to have this option. And thank you to Mountain View and the other progressive cities that made this available. It's been a big positive to me! Whether sneaky or not, requiring people to opt out is objectionable. Shifting the burden to consumers will usually succeed because few take the time to become informed. Just because the Legislature made it a law, does not make it honest and open. Requiring people to opt out places the burden on consumers to be informed. Requiring people to opt in is government preservation of a private monopoly that's literally why the opt-out model was adopted. Which one is better for consumers? So who's paying for SVCE's "moral hazard free ride"? 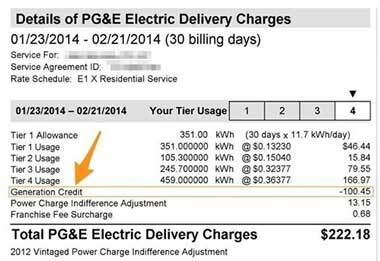 Taxpayers, or PGE customers? Something about this whole SVCE setup stinks to high heaven. They completely mis-informed us about the percentage increase this would add to our bills. I hate them and I'm a nice cobalt blue environmentalist. I think the "surcharge" that is being alluded to is the "Power Charge Indifference Adjustment"? If so, I agree that there is something fishy about this. Okay, that makes some sense that they might have such charges and that, over time, these contracts expire and this charge disappears. It implies they will continue to write contracts for the power we are not taking from them. It is being charged throughout the state, to all of the community energy companies and puts a big headwind against making progress on updating our energy production. Your only escape is to completely drop off the grid. But nobody will say exactly when they expire, causing a lot of CCE supporters to skeptically wonder if they'll ever go away even though they should, by all rights. Demanding answers from the CPUC is a good thing. But that was somewhat fluid, and I don't know the final resolution. Their tentacles are everywhere.